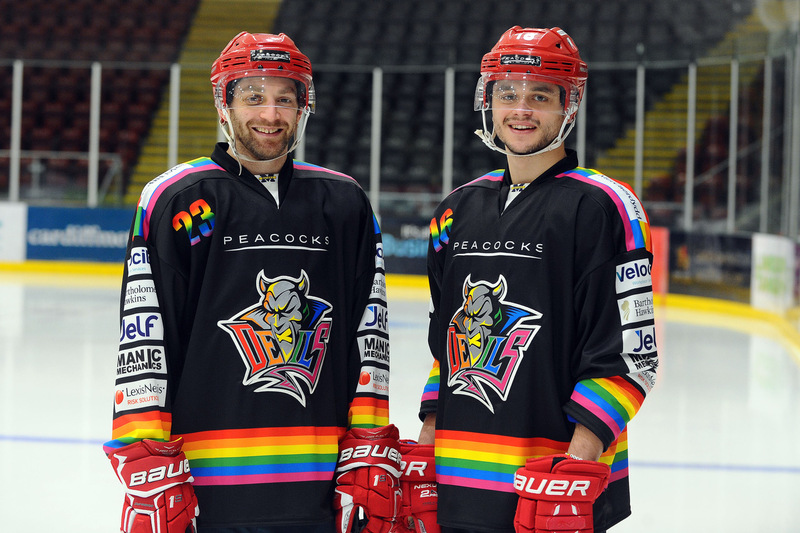 Cardiff Devils' players Evan Mosey and Sam Duggan show off the Pride jerseys. Saturday night is ‘Pride Night’ for Cardiff Devils. Captain Jake Morissette and his Devils have a new set of jerseys for the Elite League clash with Coventry Blaze at the Viola Arena in Cardiff Bay. Devils’ jerseys are shown off in our photographs by Pride Ambassadors Evan Mosey and Sam Duggan. The full set of jerseys will be up for grabs in a post-game auction on Saturday immediately after the game against Blaze. Cardiff’s jerseys feature the Pride Rainbow, Devils main logo and numbers stitched onto the jersey. Cardiff Devils forward Sam Duggan in his new jersey. The match against Blaze highlights Devils’ partnership with LGBT Sport Cymru and is the second year in a row the Welsh club have supported LGBT History Month. Elite League leaders Devils will play in front of a sell-out 3,000-plus attendance at the Viola Arena with less than 100 tickets remaining as of Wednesday morning. Layne Ulmer will miss the match against Blaze, completing a three-match ban, while Joey Haddad and Evan Mosey are both recovering from injuries. Haddad is closest to returning and will be assessed later this week. CLICK HERE to be redirected to the full fixtures list.